Getting traffic is the only motivation of every site owners. Good content is the keyword of getting traffic. Even if you writes well you have to do some tricks to get traffic from Search Engines this is called Search Engine Optimization (SEO). SEO is the important to every blogs and websites. If you are a site owner you must know about SEO. Now Google India starts new program called India Site Clinic to give the valuable SEO advice to India site owners. Google created a register form for site owners to register their sites for India Site Clinic. 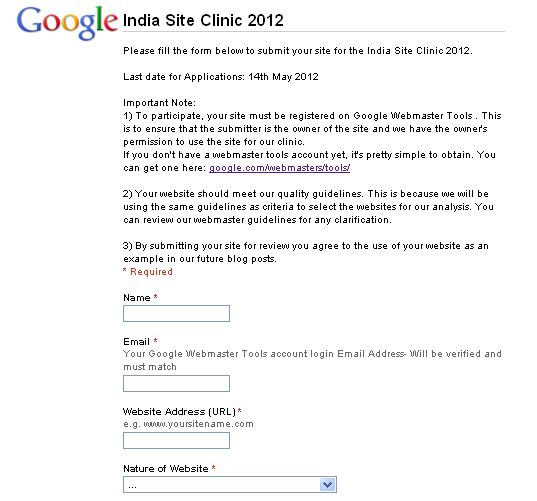 To participate in India Site Clinic 2012, your site must be registered on Google Webmaster Tools. If you don't have a Webmaster tools account yet. You can get easily from here. And also your site should meet with Google's quality guidelines. If you have any doubt in Google's guidelines please check here. 14th May 2012 is the last date for submit your site to India Site Clinic 2012. This is limited offer so Google India takes some sites to complete analyse. Click this link to go to the Site India Clinic register page. Give your details and site details. Give your Email id as Your Google Webmaster Tools account login Email Address and Will be verified and must match. Finally click Submit button to Register your site.